My house is quiet this morning. After one of the busiest summers ever, everyone is now back to school. Which means that my kids need a good breakfast that will keep them fueled throughout the morning. Introducing the kid-friendly breakfast sandwich. Kid-friendly because they love to eat it and because they can make it themselves! My boys have taught me many things over the years. In 22 years of being a mom, I've learned to expect to learn things from them. One thing I never expected to learn from them, though? How to fry an egg. I mean, seriously. I've been frying eggs for more than 40 years. What else could there be to learn? Once more, I stand humbled. My son recently taught me a bit of cooking magic that I'll share with you: the easiest, fastest way to fry an egg. No kidding. Use a small, microwave-safe bowl. We use a fruit bowl from our everyday china. Break an egg into the bowl. Pierce the yolk and mix it into the white just a little. A plastic fork works well for this task and won't leave a mark on the bowl. Microwave on high power for 30 seconds. The egg will make popping sounds in the microwave, but if you've pierced the yolk it shouldn't explode. If you like, you can stick a toothpick into the yolk and leave it in while microwaving; this should prevent too much popping. Using a potholder, remove bowl from microwave. Be careful! It'll be hot! Flip egg over with the plastic fork. Microwave for another 15 seconds. Season as desired. Note: you can spray the bowl with non-stick cooking spray if you like. This makes clean-up easier, but it makes egg-flipping a little tricky. We prefer to skip the spray. This makes a fried egg that's the perfect size and shape for a breakfast sandwich. My oldest son likes a sandwich made with an English muffin, a piece of cheese, and a couple of strips of bacon on his fried egg. My youngest son likes the same thing, but prefers to use two frozen waffles instead of an English muffin. Two pieces of toast would also be good. We keep pre-cooked bacon in the fridge so that they only have to warm the bacon in the microwave for a few seconds. 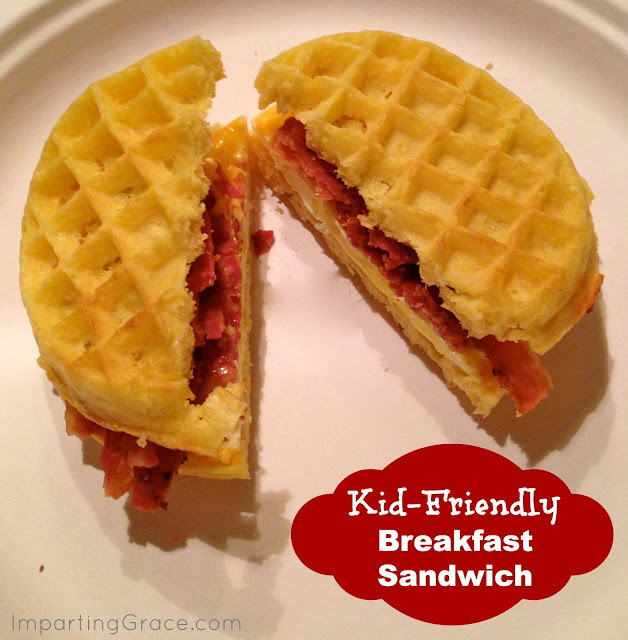 The sandwich is ready in just a couple of minutes--perfect for busy school mornings! Of course, my metabolism is not quite the same as my boys', so I don't get to indulge in the same breakfast sandwiches as theirs. 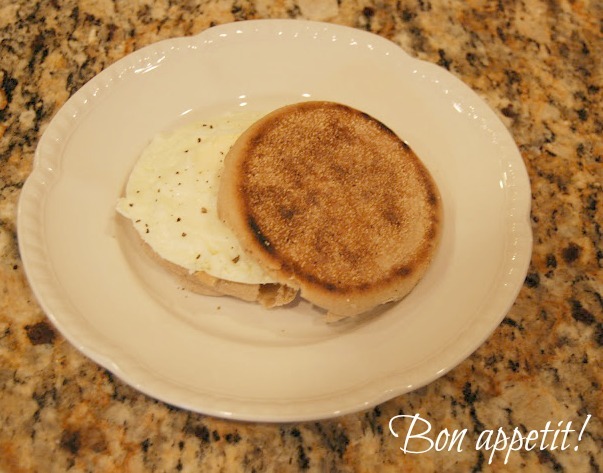 Still, one of these eggs on a light multi-grain English muffin makes a tasty and nutritious breakfast. For 170 calories and 5 grams of fat I get 11 grams of protein and 8 grams of fiber. Not bad. Do you have any simple, tried-and-true breakfast ideas for school mornings? My son would LOVE this Richella!! I'm totally going to make this for him on the first day of school and probably many more mornings after that. Thanks friend! Our go-to is Kellogg's Low-Fat Granola with Raisins with Light 'n Lively Vanilla Yogurt. All my kids love this - they get protein, whole grains, dried fruit, so what's not to love? Another is steel-cut oatmeal done in the slow-cooker overnight. With some cinnamon, flaxseed, nutmeg and chopped apples, it is good but so much better if you put in about a tbs. of sugar. A good stick-to-your-ribs meal for when the weather is cooler. Warm pumpkin bread with whipped cream cheese is a winner at my house. If you serve with milk or yogurt, you can get protein in to stave off carb drop-off. Finally, try Barefoot Contessa's Lemon Blueberry Muffins. You can make the batter the night before and refrigerate. While everyone showers and dresses, these treats bake and a warm muffin greets your student. Plus these are a yummy treat for teachers, too! Mine too Richella, metabolism has definitely changed over the years...and not to the good...LOL! Thank you for sharing the microwave egg trick! Great and so easy! Thank you! !